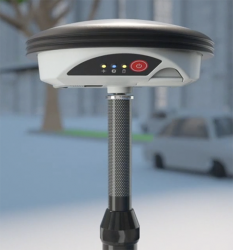 Paired with the Zeno GG04, any Zeno or third party mobile device with Android or Windows OS can now collect highly precise positioning data with Leica Geosystems’ GNSS technology and 555-channel tracking performance, according to the company. With PPP, users can collect data even in areas without cellular coverage. The bring-your-own-device (BYOD) functionality enables any smart device to collect survey-grade data, delivering centimeter results. With the Zeno Connect app, any third-party app is compatible with the Zeno GG04 smart antenna. The Zeno Mobile, Zeno Connect or Esri’s Collector for ArcGIS apps provide an easy and familiar platform for non-surveying professionals to collect and analyze data. Organizations can now integrate and enrich data in real time from different sources to collect all details of any project from anywhere in the world, regardless of how remote, according to Leica Geosystems. Described as rugged, flexible and easy-to-use, the smart antenna not only uses RTK technology but can now apply PPP. This now makes real-time, high-accuracy data collection possible in the most demanding of locations without the need for a mobile data connection. With its compact, lightweight design and IP68 durability, you can work for longer in all conditions, and bring high accuracy mapping to your fingertips, according to the company. PPP works by using a satellite-based correction service to broadcast data directly to the GG04. Corrected data is processed onboard the antenna and delivered seamlessly to your device. PPP is available anywhere in the world at any time. It can mount on a pole, backpack or vehicle, and the antenna’s scalable performance can be tailored to fit your needs. With 555 channels, it is designed to provide more signals, fast acquisition, and high sensitivity. The antenna delivers satellite signal tracking for GPS (L1, L2, L2C, L5), GLONASS (L1, L2), BeiDou (B1, B2, B31), Galileo (E1, E5a, E5b, Alt-BOC, E61), QZSS2, SBAS (WAAS, EGNOS, MSAS, GAGAN), and L-band.